Oyster Bay, in Sunset Beach, NC is the northern most track affiliated with The Legends courses managed by Arnold Palmer Golf Management. My group played here on a recent trip in early June. Located close to the ocean, the course boasts a variety of holes that weave their way around scenic lakes and marshes and are buffeted by the stiff ocean breezes. Notable holes begin with #14, a downhill par 5 with a large tree to negotiate in the middle of the fairway, which is followed by a risk-reward carry to the green over water. This is followed by #15, a beautiful short par 3 surrounded by water that challenges the player’s ability to keep a ball down under the prevailing sea breeze. #16 is a long par 4 that plays downwind and is bordered by water on the right and in front of the green. Set just inside the ocean, these three holes, along with the par 5 fifth hole (pictured above), provide a standout variety of challenges for the nature loving golf enthusiast. Course conditioning is less than spectacular, with several brown patches intruding on some greens as well as a good number of burned out tee boxes and worn spots in the fairways, but the scenic views and variety of holes make this a very fun course to play. Greens fees run $79 dollars during June and July and include cart but range balls are extra. Our group was playing on the package offered by The Legends which included breakfast, lunch, two drinks, and golf, which was a great deal. If you are a playing conditions purist, Oyster Bay’s value is middle of the road at best. Our group felt like we easily got our money’s worth and enjoyed a second 18 in the afternoon at a $30 replay rate which was discounted, as the course honored our 9-hole price replay card from our scheduling snafu at Heathlands earlier in the week. We viewed Oyster Bay very favorably and would rate it a top value except for the slightly scrappy conditions. The clubhouse structure was a bit dated and the grill was on the smallish side and offered a limited variety of food choices, especially on the breakfast buffet and just a few ready made sandwiches and hot dogs for lunch. The pro shop seemed nicely stocked for its size. Oyster Bay has a medium size grass driving range with balls costing $5 for a bag. There’s a good size practice putting green where chipping is allowed since there’s no separate short game area. Most holes on the course are surrounded by houses albeit very beautiful properties, but there is little privacy during play. The course had double teed groups from 7:00 to 9:00 a.m. and we began our morning on the 10th tee accompanied by a very friendly and informative starter/marshal. We played our first nine quickly and our marshal visited us a couple times on the course to inform us that our pace was good and on one occasion brought a player in our group some fresh ice and cold towels to relieve a painful shoulder injury that had flared. We appreciated the assistance but when we turned the pace slowed to a crawl with three and four groups playing each hole and we never saw our marshal again. Ultimately our second nine took three hours to play which taxed everyone’s patience. A few of us decided to replay and went out again shortly after 2:00 p.m. and breezed around 18 holes without waiting on a single shot which picked up our spirits and provided a very enjoyable afternoon. If you are interested in 18 holes on the weekend during the summer, try to reserve between 1:30 and 2:00 p.m. for the best pace of play. The final verdict: If you want a beautiful layout and don’t mind playing on less than stellar conditions, Oyster Bay is a good choice. 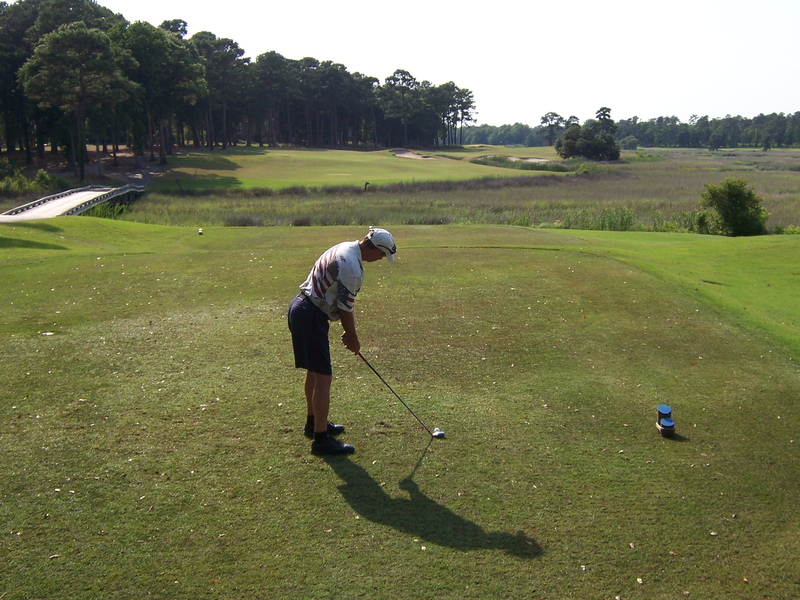 This entry was posted in Course Reviews, Myrtle Beach, North Carolina, Travel and tagged course review, Golf, Myrtle Beach, Oyster Bay, sports, travel. Bookmark the permalink.